Several conditions and injuries cannot be fully healed in a single session at Advanced Physical Medicine but instead require a treatment program. This is where our Yorkville physical therapy plans help with rehabilitation. Our medical doctor, Dr. Farah Malik and our chiropractic physician, Dr. Brian Berkey, employ this type of therapy to help alleviate pain, restore mobility and function, strengthen the affected area, decrease the risk of permanent or recurring damage and get patients back in action after an injury. The first step in any treatment program at our clinic is a full physical examination and evaluation so we can properly assess each situation and design a personalized treatment plan. Physical therapy can be effective in a number of situations, especially those involving a sports injury, auto injury, and/or work injury. Chronic conditions, such as arthritis and back pain, can often be alleviated with the therapy, as can tennis elbow, frozen shoulder and carpal tunnel syndrome. Therapy treatments have also been effective for cerebral palsy, heart disease and scoliosis. Like our other chiropractic treatments, the therapy is a non-invasive treatment. Its aim is to assist the body in healing itself naturally, as all bodies are designed to do. We employ a number of techniques in our therapy programs, depending on each individual situation. Options include massage therapy, ultrasound, electrical stimulation and rehabilitative exercises such as therapeutic exercise and neuromuscular re-education. Massage therapy consists of hand-on treatment that involves rubbing, kneading and gently manipulating the skin and affected area. It can alleviate pain and release tension in the affected area while increasing blood flow and providing overall relaxation. Therapeutic ultrasound uses sound waves to produce a massage that stimulates tissue beneath the skin. The sound waves are very high frequency, making them inaudible to humans and effective for treating cells and small molecules in the body. Our Yorkville chiropractic physicians and therapists use ultrasound therapy to gently massage the deeper layers of muscles and tissues in the affected area where it can reduce swelling, increase blood flow and assist with healing. Our electrical stimulation therapy is similar to ultrasound in its effects, but it uses low-frequency electrical currents to treat the affected area. Moist heat therapy is another technique we employ, using heat to help alleviate pain and improve healing. An integral part of most of our Yorkville physical therapy treatment plans is rehabilitative exercises, which patients can perform in our office and at home. We can suggest and demonstrate a number of gentle exercises that help improve mobility, functionality and strength in the affected area. 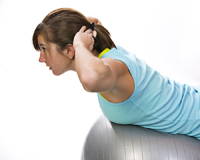 We understand that sometimes exercise can be painful. That is why we work one on one with you and develop an individualized program for your needs. Exercises are especially vital following an injury to help ensure the surrounding muscles do not become excessively weak during the recovery process. They also help prevent future injuries from recurring in the same area and maintain in chronic conditions and diseases. Exercises typically consist of gentle stretching and strength-building moves that specifically target the area being treated. If you have been injured or suffer from a chronic condition, call us at 630-553-2111 to find out if our physical therapy treatments can help.